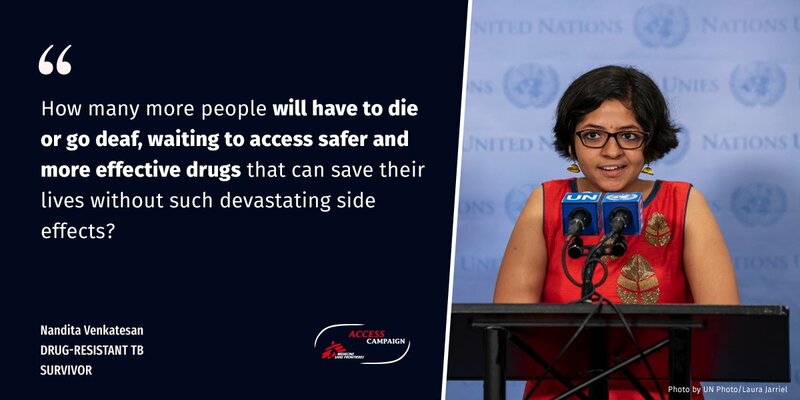 MSF sent an open letter to Johnson & Johnson urging the pharmaceutical corporation to take action so that countries can access an affordable and sustainable supply of the critical drug bedaquiline, used to treat multidrug-resistant tuberculosis (MDR-TB). Following the World Health Organization’s (WHO) recent guidance recommending that bedaquiline be used as a core drug in standard MDR-TB treatment regimens, national TB programmes will need to scale up access to bedaquiline-containing regimens, but the price set by J&J remains excessive for countries hardest hit by MDR-TB. We call on J&J to demonstrate bold leadership in ensuring affordable access to bedaquiline for everyone who needs it to survive. 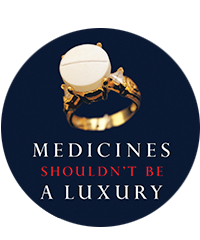 For the past decade, Médecins Sans Frontières (MSF) has been in dialogue with Johnson & Johnson (J&J) about the critically important TB drug bedaquiline, including on access to bedaquiline for MSF-run clinical trials, compassionate use of bedaquiline for people with extensively drug-resistant TB (XDR-TB), and routine use of bedaquiline to treat multidrug-resistant TB (MDR-TB) in MSF medical projects. 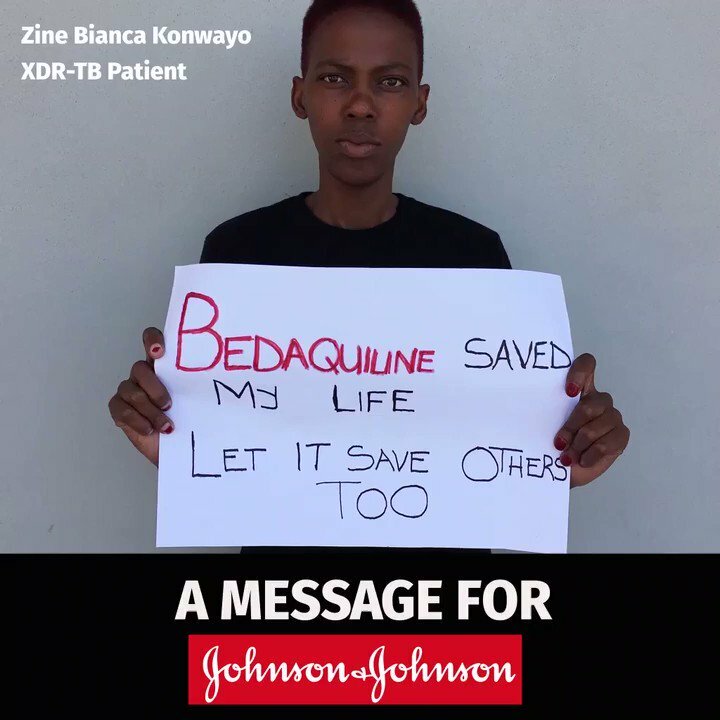 We are writing now to J&J regarding the need for all countries to secure an affordable and sustainable supply of bedaquiline given the expanded use of bedaquiline to treat more forms of MDR-TB globally. In 2013, soon after its registration based on limited phase II safety and efficacy data, the World Health Organization (WHO) recommended the use of bedaquiline as an add-on agent in its MDR-TB treatment guidelines based on the consideration that new and improved treatments for MDR-TB were desperately needed because success rates using available treatments remained low. 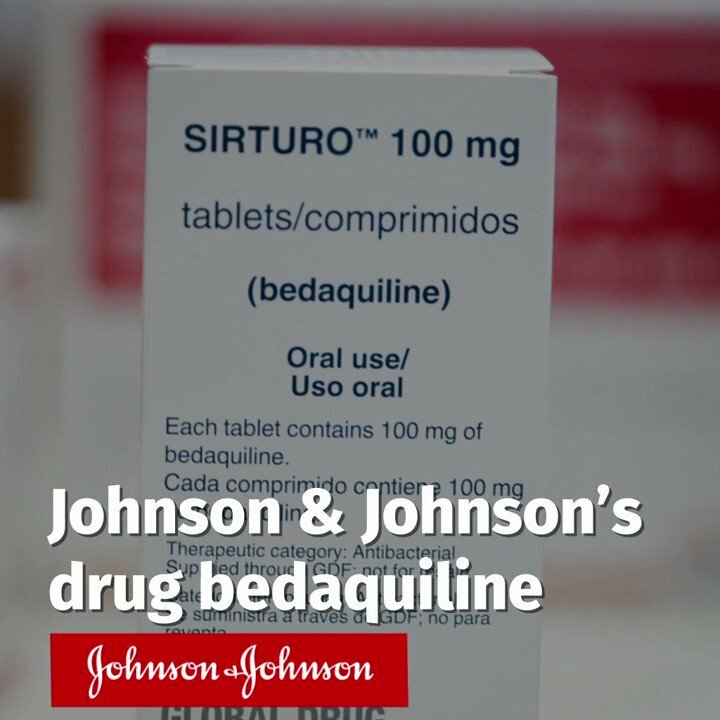 However, obtaining affordable access to bedaquiline for patients in high TB burden countries has until recently relied on either the J&J/USAID donation programme or bilateral price negotiations with J&J or its partners. The recent reduction to US$400 for a six-month treatment course for some countries, including South Africa and those procuring through the Global Drug Facility (GDF), is noted. 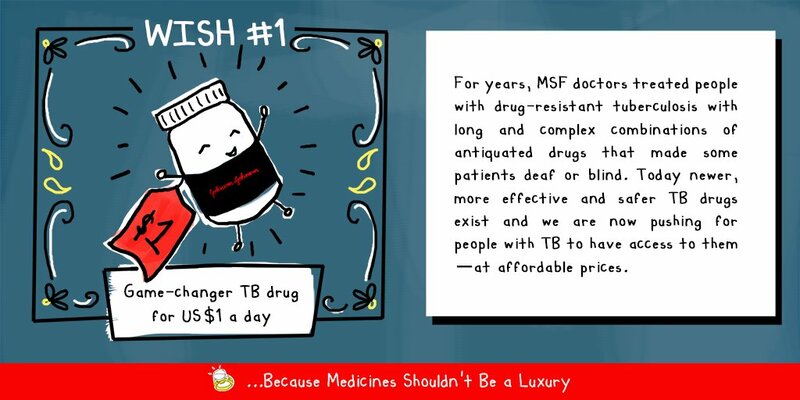 However, this price remains excessive for the countries hardest hit by MDR-TB. Bedaquiline was granted accelerated approval by the US Food and Drug Administration (FDA) in 2012 as part of combination treatment in adults with pulmonary MDR-TB.3 Conditional marketing authorisation for bedaquiline was subsequently granted by the European Medicines Agency (EMA) in 2013. Both the US FDA and EMA provided approval based on limited safety and efficacy data from a phase IIb study to fulfil an unmet medical need as MDR-TB is a life-threatening disease which represents a health emergency of global proportions. In both cases, approval came with the requirement of conducting additional studies to confirm clinical benefit. 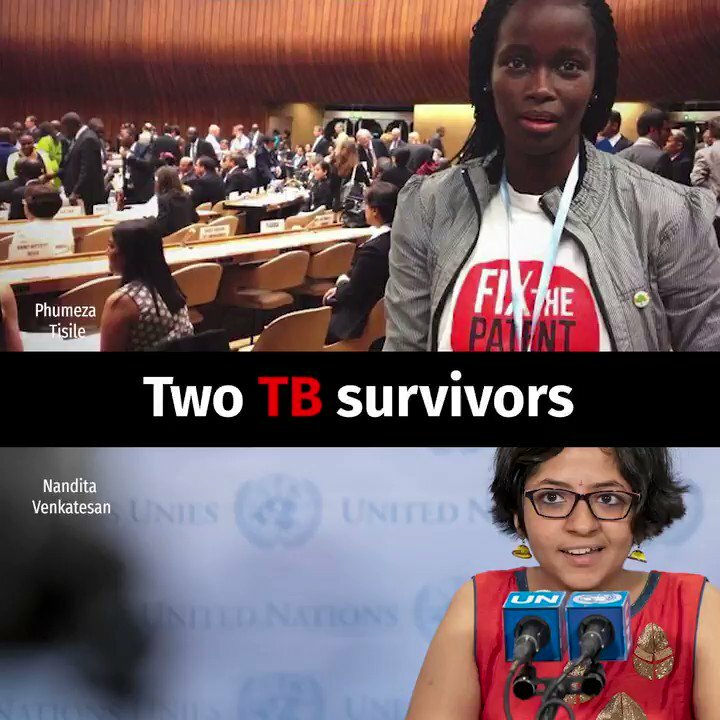 When bedaquiline was authorised, it was the first new TB drug that was specifically developed for TB in nearly 50 years, thereby raising hopes for hundreds of thousands of people infected with forms of TB that had been practically untreatable. While J&J did not conduct phase III trials as part of their initial bedaquiline development programme, several of the phase I and II trials conducted prior to the drug’s registration were sponsored by the US National Institutes of Health/National Institute of Allergy and Infectious Diseases4,5 and the TB Alliance.6,7 A phase III trial (STREAM II) including bedaquiline is currently underway, but it is sponsored by the International Union Against Tuberculosis and Lung Disease and funded by USAID.8 Together with Partners in Health and other partners, MSF is also sponsoring a phase III clinical trial including bedaquiline, with funding from UNITAID.9 Meanwhile, J&J earned a tropical disease priority review voucher (PRV) for bedaquiline, which the company used to accelerate review and marketing authorisation of guselkumab, a blockbuster psoriasis drug that sells for nearly US$60,000 per patient per year in the US and is estimated to yield US$3.49 billion in sales by 202410. Pharmaceutical companies have sold tropical disease PRVs for as much as US$350 million.11 As bedaquiline was also granted orphan drug designation, J&J further benefitted from a 50% tax credit on qualifying clinical research and development expenditure as well as exclusive US marketing rights for seven years. The public and philanthropic contributions made to date warrant a guarantee of public return on these investments. Indeed, following the approval of bedaquiline based on phase II data, several research institutes, treatment providers, including national TB programmes and MSF, have invested in additional trials, operational research, and pharmacovigilance to further document the safety, efficacy and optimal use of bedaquiline for the treatment of MDR-TB. These significant contributions are financed with public and philanthropic resources and conducted as a collective effort by a TB community desperate to provide people with MDR-TB with improved treatment options. The recent WHO recommendations of bedaquiline as a core drug for the treatment of MDR-TB are largely based on the data and experience produced through these collective efforts. 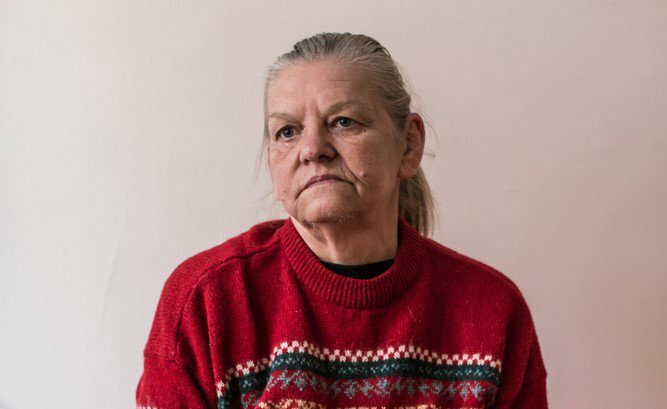 The TB community and public funders have made an important collective investment in demonstrating the public health value of bedaquiline, including through ongoing trials that will enable long-awaited shorter-course, all-oral treatments that have the potential to transform our ability to tackle this deadly disease. Given the critical public health value of bedaquiline for the treatment of MDR-TB and given the financial windfall J&J has enjoyed as a result of its PRV, we believe J&J has a clear responsibility to do more to ensure affordable access to bedaquiline. While J&J holds proprietary patents covering bedaquiline in many countries, the public and philanthropic contributions made to date warrant a guarantee of public return on these investments as well as a common right to use that ensures bedaquiline is accessible to all MDR-TB patients who need it. J&J can demonstrate its commitment to people living with TB worldwide by taking the following specific steps. Register bedaquiline: Domestic registration is key for national TB programmes to incorporate bedaquiline as a core drug in MDR-TB regimens. MSF acknowledges the efforts J&J and its partner, Pharmstandard, have made in recent years to register bedaquiline in their respective geographical territories – the Commonwealth of Independent States and Georgia for Pharmstandard, and the rest of the world for J&J. However, there are 18 high-burden countries where bedaquiline is not yet registered. MSF urges J&J and its partners to expedite registration in these countries and make information on registration plans and registration status public. In addition, in countries where bedaquiline is already registered, J&J should promptly share available paediatric use data and start the process to request an extension of indication for children aged six years and above with all national regulatory authorities. Lower the price of bedaquiline: MSF and others have called for MDR-TB treatment regimens to be priced below $500 per person. Researchers have concluded that bedaquiline can be manufactured and sold profitably for prices between $8 and $16 per month.12 Accordingly, it is reasonable to expect that bedaquiline should be priced no higher than $32 per month, which would play a major role in facilitating the rapid scale-up of new WHO-recommended regimens. Fair and transparent pricing should be available in all countries through J&J and its partners, including in low- and middle-income countries and high-burden countries. In this context, we would also like to draw your attention to the price that your commercial partner, Pharmstandard, charges in Commonwealth of Independent States countries. The price – US$264 per month (US$1,584 per six months) – is significantly higher than the price of US$67 per month available to countries purchasing through the GDF. Issue a non-exclusive license for bedaquiline: In the past, dependence on a sole supplier for production of essential medicines has not only kept prices high, but has also led to shortages and sudden breaches in supply due to unforeseen circumstances.13,14 Because bedaquiline base compound patents will not begin to expire in different jurisdictions until 2023, generics manufacturers will not be able to supply the drug to TB programmes for more than five years from now – even if WHO-prequalified – unless a non-exclusive voluntary license is issued. In order to ensure sustainable supply through additional manufacturers, MSF urges J&J to issue a non-exclusive voluntary license to the Medicines Patent Pool. The geographic scope of the license should cover at least all low- and middle-income countries and all high TB burden countries in order to ensure long-term sustainable supply to TB programmes. Stop further monopoly building around bedaquiline: MSF urges J&J to refrain from patent evergreening strategies that will further delay the availability of quality-assured generic versions of bedaquiline. J&J applied for and received a patent on the salt form of bedaquiline in South Africa15 that extends its monopoly on the drug until 2027, creating unwarranted additional barriers for the supply of generic versions of the drug. We urge J&J to abandon or withdraw from such evergreening patents and provide full transparency on the patents it holds or is pursuing that may hamper the timely availability of generic versions of bedaquiline. Provide access to bedaquiline for patients whose treatment must extend beyond six months: For patients whose drug susceptibility testing (DST) diagnosis confirms extensive drug resistance and who have an insufficient number of effective drugs in the continuation phase, J&J should facilitate and ensure the availability of bedaquiline to treatment providers beyond six months, as interruption of bedaquiline could result in culture reversion, drug resistance and treatment failure. We would like to explore solutions for these patients with J&J’s medical team. Given the critical public health importance of bedaquiline and its capacity to save lives, as well as the fact that the development of the drug and demonstration of its clinical benefit have been driven in large part by public funds and the TB community, we believe bedaquiline should be recognised as the fruit of a collective effort. We call on J&J to demonstrate bold leadership in ensuring affordable access to bedaquiline for everyone who needs it to survive. We look forward to receiving your responses to the requests above and we welcome the opportunity to discuss these issues with you further. #Wishlist2019 @JNJCares has the power to grant our first wish of the year!No more toxic drugs. No more injections. 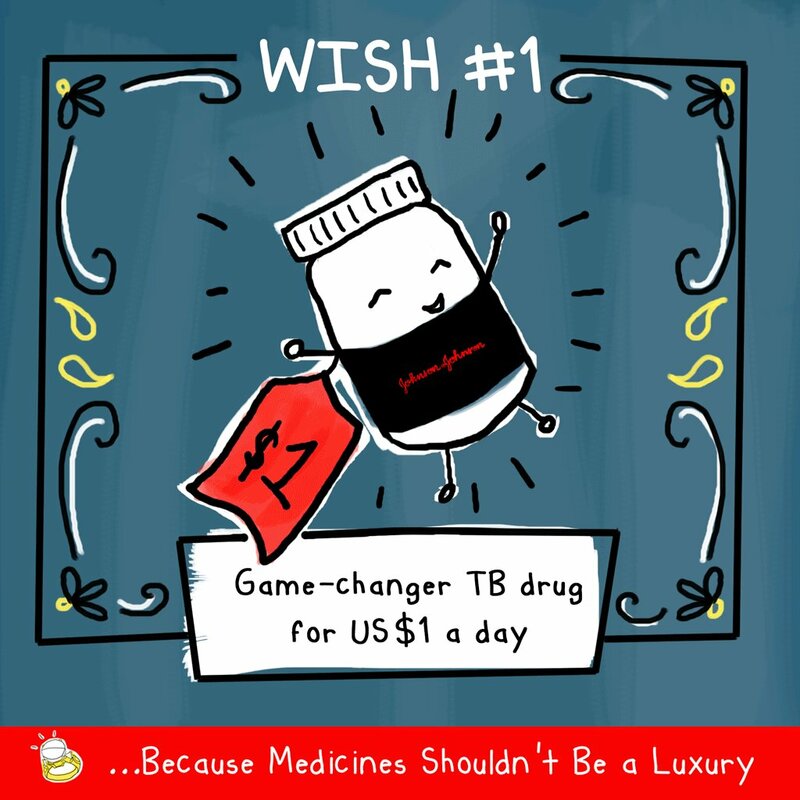 No more people forced to choose between deaf or dead.Cut the price of lifesaving TB drug #bedaquiline to $1/ day.